A prized soap created to celebrate 60 years of producing the world's finest soaps. This luxurious soap is infused with real 24 carat gold leaf and features the signature fragrance of the floral emblem of Florence, Noble Iris. The natural soaps by Nesti Dante come from the constant search for excellence. Following the great Italian tradition of quality, since 1947, Nesti Dante has been producing high-performance, natural soaps with love and care. This means guaranteeing the best raw material, great care and an obsessive attention to detail for every soap. All these values are those of entirely Italian production, according to standards and systems that make excellence the distinguishing feature of the soap manufacturer, Nesti Dante. To celebrate the 60th anniversary of when the young Dante prepared his first cauldron in Florence, the great skill of the Saponeria Nesti has produced a beautiful soap with 24 carat gold leaf, a futuristic beauty product with all the great value of the most desired metal. The privileged relationship that has always existed between gold and the skin is rediscovered and given its right value. Since the times of ancient empires, Gold, a noble matter by definition, has so much been an element of longevity that the Initiation to Pharmacopoeia states: “Gold annihilates everything that may represent a danger and destroys what is toxic. It restores balance to the circulation of the energy of the medians.” Recent biological studies have also scientifically tested the mineral in terms of efficacy on cellular regeneration and protection against free radicals, highlighting its antioxidant power. This new contribution to beauty is further enhanced by the intense velvety note of Noble Iris, the flower and symbol of Florence that radiates irresistible sensuality as Maria de Medici who always carried one with her, claimed. A prized soap created to celebrate 70 years of producing the world's finest soaps. This luxurious soap is infused with platinum and select floral notes. 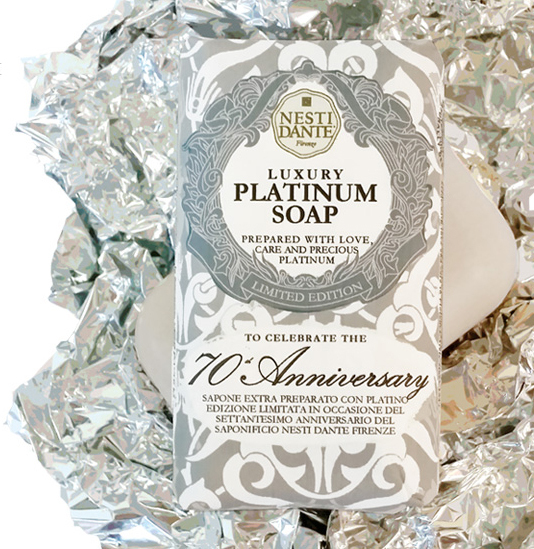 To celebrate its 70th anniversary, Nesti Dante has created a precious natural soap prepared with Platinum, the most precious of materials. Platinum, thanks to its beneficial qualities, has always been appreciated in ayurvedic medicine as a precious antioxidant that promotes healthy, firm skin. Enriched with intense notes of Camelia Bella di Firenze and the precious Granduca di Toscana White Jasmin.